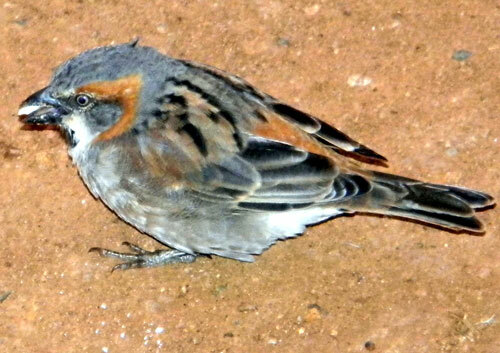 This is a common seed eater in Kenya highland farms, orchards, savanna and urban settings. They often forage on the soil for seeds as well as scraps of food dropped by people. Insects form a major part of the diet, particularly during nesting. 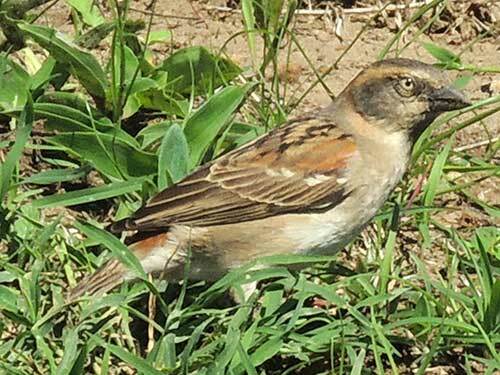 Although there are many kinds of small brownish birds this one can be reasonably recognized by the rufous and gray head, the black throat patch, and the pale eyes. The female lacks extensive rufous (reddish brown) color in the plumage, but retains the pale eyes. Mweiga, Nyeri, Kenya. Dec. 2015.